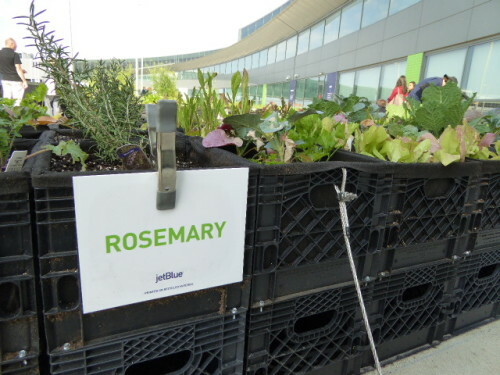 We can’t quite call it a trend yet, but the urban farming movement is making headway at airports. Created in 2011, O’Hare’s aeroponic garden grows more than 1,000 plants – without soil – in 26 towers, producing herbs and vegetables used by some of the airport restaurants, including Tortas Frontera. The indoor garden is on the mezzanine level of the O’Hare Rotunda Building, in Terminal 3 over the corridor to Concourse G.
The 24,000-square-foot T5 farm is growing produce, herbs and blue potatoes, the kind used to make the Terra Blues potato chips JetBlue offers as complimentary snacks to passengers. Potatoes, plus a wide variety of herbs and vegetables, are planted in raised beds made out of milk cartons bolted to the concrete. The food grown will be used by restaurants in T5 and donated to area food pantries. And some of the blue potatoes may someday make it across the river to the New Jersey factory where the Terra Blues chips are now made out of blue potatoes grown on an organic farm in Maine. Here are some more snaps from opening day at JetBlue’s T5 farm, which is located curbside, way to the left of the departure level doors. And here’s a link to a story I wrote about the farm for USA TODAY. Great idea, would love to see more airports implement this. People need to realize where food comes from.